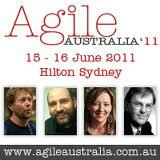 Day 2 at Agile Australia 2011 and another jam packed day. Here are my notes from the sessions I attended. Jean Tabaka presented this keynote, barefoot, and her slides are available here. Software Engineering is defined by the IEEE is the application of a systematic, disciplined, quantifiable approach to the development, operation, and maintenance of software, that is, the application of engineering to software. This led me to then get a definitive definition of engineering, which is loosely defined by a number of the leading engineering councils worldwide as being the discipline of acquiring and applying scientific knowledge, mathematics and ingenuity to design and build solutions that safely improve the lives of people. Software engineering as a term has been around since the early 1960s, and, as Rob Thomsett pointed out in his keynote yesterday, was popularized when NATO hosted a conference to address the problems of software development. In there report, they particularly point out that the phrase software engineering was deliberately chosen to be provocative. So for the last 50 years, practitioners everywhere have been debating software engineering, from the software crisis that made developing software into a career, through to Fred Brooks coining the No Silver Bullet argument that no individual technology would make a 10 fold improvement in productivity in 10 years, through object oriented programming and the rise of XP and agile. So what is software engineering. Is it an engineering practice that is dead? Is it a craft or an art form? Or is it both dead and a craft? Martin Fowler is the Chief Scientist at Thoughtworks, author of many books on software development and a signatory to the agile manifesto. Kane Mar is the President of Scrumology, and has been a developer and coach in the software industry for 20 years. Paul King is the Director of ASERT and has been developing, training and contributing to the software development field for nearly 20 years, and is an active contributor to a number of open source projects including, most notably, Groovy. The time flew by and I did not get to take anywhere near the number of questions I would have liked from the audience. The highlight was a question from the audience from Phil Abernathy who asked the panel if perhaps we should term what comes out of a number of projects as “crapmanship”. I had the pleasure of introducing Rebecca Parsons from ThoughtWorks, her slides (in all their Comic Sans MS glory) are available here. The session I presented got a good turnout, and plenty of questions afterwards as well as some follow-up emails. The slides are available in a separate post as well as here. I introduced Sascha Ragtschaa from Computershare, his slides are available here. I had the pleasure of both introducing and being a live prop (the dragon representing the (large) organisation) in this presentation by my good friend and colleague Renee Troughton from Suncorp. Her slides are available here. Martin Fowler delivered his now famous 3 short keynotes. this was a repeat session from last year where Martin did his famous Uncle Bob Martin rant. A highlight for me was in his example he used Nigel Dalton as good code example and me as a bad code example. I led a conference retrospective after the post-conference drinks. For those who stuck around, we had a good discussion on what was good and what we could do better next year. Also, a couple of mentions for some of my other friends and colleagues who presented on day 2 but due to my other commitments I could not attend their sessions. Jonathan Coleman, Steve Jenkins and Phil Abernathy all did lightning talks which were all well received. Nicholas Muldoon from Atlassian delivered a talk called “Be The Change You Seek”, his slides are available here. Paul King (who I have presented with many times previously) delivered a workshop called “Leveraging Emerging Technologies in Agile Teams”, his slides are available here.